The oldest orthologs of AQP2, -5, and -6 are currently found in the coelacanth (Latimeria chalumnae) with three aqp2-like paralogs (aqp2a, -2b, and -2c, Fig. 2013 The African coelacanth genome provides insights into tetrapod evolution. Gulf Island Fabrication Inc (NASDAQ:GIFI), a fabricator of offshore drilling and production platforms, hull and/or deck sections and other specialised structures, disclosed on Monday that its subsidiary Gulf Marine Fabricators has received a Letter of Intent (LOI) for a contract to fabricate 1200' jacket from Walter Oil & Gas Corporation's Coelacanth Project at Ewing Bank 834 in the Gulf of Mexico. NASDAQ: GIFI), announced today that, through its subsidiary Gulf Marine Fabricators, it has received a Letter of Intent in anticipation of a contract for the fabrication of a 1200' jacket from Walter Oil & Gas Corporation for its Coelacanth Project located at Ewing Bank 834 in the Gulf of Mexico. The coelacanth fish is an example of which Tasmania before it assumed its present title informal biological term? 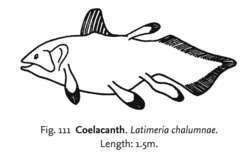 18) While an undergraduate he undertook considerable work for James Leonard Brierley Smith (1897-1968), the renowned South African ichthyologist accredited (probably bogusly, see Hodgson & Craig 2005: 5) with the identification of the first extant Coelacanth (Latimeria chalumnae Smith). A new coelacanth from the Middle Devonian of Latvia. The coelacanth, the oldest known fish in history, is still found in south Africa. By the 1970's, among White or Black San Franciscans, "God-damn-it" was a Komodo dragon or a coelacanth of maledicta, a living fossil, which had miraculously survived from an earlier time. Even if these mystery creatures were found (like the coelacanth or the okapi), the search would be over and they would quickly move into the realm of zoology where the real science would begin. What he lied about was the size of his coelacanth *, and the more he repeated the story the bigger his coelacanth grew, until it was the most massive ever claimed by any humanoid angler, Neanderthal or Cro-Magnon. The Triassic coelacanth fish Diplurus, with observations on the evolution of Coelocanthini.